While others shared celebratory posts of last Sunday’s (December 4, 2016) news of pause on work on the oil pipeline at Standing Rock, and Sikhs worldwide marked the anniversary of their Ninth Guru, Tegh Bahadar’s, famed 17th century martyrdom for the freedom of religion for people of all faiths, Navkiran Kaur -- “Navi” to friends -- circulated her campaign to fundraise support for a friend who remains at Standing Rock despite arrests and the freezing distance from her California home. Cautious optimism comes easy to 23-year-old Navi who went to Standing Rock last month, drawn by the call of water and roots. Seemed to me like the perfect person to talk to on a Gurpurab [literally, Guru’s-day]. Navkiran insists there are people doing tremendous work, and her contribution has been only very small. Its impact on her own life has been much larger, she admits. That is the beautiful thing about the kind of solidarity Guru Tegh Bahadar exemplified: it isn’t about saving anyone so much as it is about defining ourselves and clarifying where we stand on human rights. Mallika Kaur: Do you remember when and how you first began caring about what was happening in Standing Rock? Mallika: Punjab -- the Indian half -- is that where your ancestry is from? Mallika: But wait a second. Your 9 to 5 sounds hardly mundane … talk a little about what you do? Navkiran: Right! I work at Code2040, a nonprofit that supports Black and Latino college students, preparing them for careers in technology … day to day of course, it means answering email, planning for events, logistics, finances. So sometimes, you start feeling less direct impact. The moments I get one-on-one with students are great. But then again, listening to what our comrades were facing in Standing Rock … that started really getting to me. At some point I started sending money. But I wanted to do more. Mallika: Let’s get there. But first, what brought you, right out of college, to working with minority communities of color, and very aware of opportunity gaps? Mallika: How did your own community, other folks perceive this bridge building? Navkiran: Ah, it was complicated. It is clear this is the Sikh way. Mallika: Yes, and now let’s fast forward to Fall 2016. You are involved in education work with students of color in Oakland. And you are hearing and reading about what’s happening in North Dakota. What was going on in your head? Navkiran: Yeah. So my friend there was also part of the peaceful prayer … It’s important to note that they do not say they are protesting. And they are not protesting. They are protecting water. In response came the arrests, the violence, and more. My friend was taken in twice. Her backpack, all her personal property had been kept. No reasons. No process to get it back. Mallika: So you were hearing stories that were making you mad, but that also clearly indicated that there was strong resistance, real tension, and yet, you decided to jump, in. You could have sent donations via Amazon. What compelled you to go? Mallika: So it was harder stepping away from a job you’ve had a year out of college …? Navkiran: No, I mean, I have a full time job! I have enough money in the bank so I said I would go and put myself on the front lines. Fortunately, I was not arrested. Mallika: So, you first went, set up camp, and then headed out for actions? Navkiran: Those come from the pipeline actions. Yes, not the camp. We drove 31 hours, after two friends and I got together in L.A. No stops. We took supplies. A lot of food. Lots of canned goods we took to the main kitchen. And blankets and tarp and sleeping bags … we were taking a lot of it for Red Warrior Camp, because that is the direct action camp, within Oceti Sakowin. We got there November 14. The first thing I remember is that it was freezing cold. Mallika: What’s the make up, racially? Navkiran: I saw, actually, a few East Asian women. I came with one Korean woman and one Mexican/ Persian biracial man. But honestly, the camp itself was mostly white. We are talking thousands of people. Majority white or white-passing. And there is a lot going on. Some folks don’t treat allies as nicely. Some say all allies must be treated very well. And then there are the white people not doing anything. And those doing amazing work. And there are people who, just like, didn’t go to the orientation! 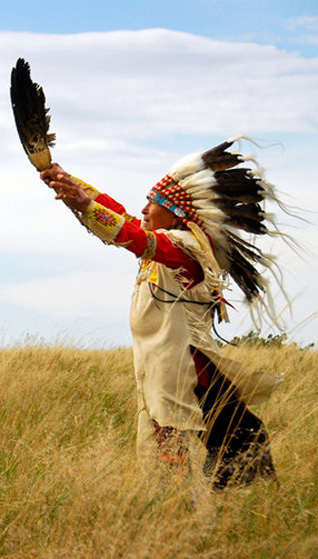 There are people being disrespectful to basic Lakota values … So it’s a mix. Mallika: Just like the real world. Navkiran: Yes, definitely. There are definitely people camping out, chilling, not bringing their own food … and I’m not clear what the process the camp has to deal with this. It shouldn’t fall on the indigenous folks who already have a lot to do. I learnt and held on to 3 key points we were told at orientation, the first morning we woke up in camp: Everything is indigenous-centered; We are building a legacy; and You must be of Use. Mallika: Given these values, what’s the atmosphere at the camp itself? Navkiran: Yes, it’s definitely hopeful, and that camp … it is a little bustling town. Kids running around ... There is even a school there. There are several kids. I played with like ten, and heard there are 30-40 there. And that is not even counting Sacred Stone camp, I didn’t go there. And there are plenty of things to do for those not going to actions. I really enjoyed going to and assisting in the communal kitchens. Cooking and serving, that’s something Sikhs are taught to do well. Navkiran: I have pretty much grown up knowing that serving people food is the greatest thing you can do. My mom has instilled that in me. And I love to cook and to feed people. And so yes, that was the one intention I came in with, that I want to cook, provide, or serve people food. And once I got there, I did have to think Ok, I need to let go of all my intentions and expectations … but yes, the serving people, really harks back to Sikhism for me, and what is really important. Mallika: You’ve mentioned your Mom. Lets talk about your parents. Did they know you were going to Standing Rock. Navkiran: Oh yeah. They tried to stop me so many times. They tried to stop by on the very day I was going, when I was already in the car! Mallika: You clearly had thought about what you were doing. Putting your body in the way. And taking heat off people on the ground. Navkiran: There were arrests made at the actions I went to, but, I was never one of the persons grabbed or anything. Because they are specifically targeting indigenous people, indigenous women especially, it seems like. At one point, we noticed men not standing in front while indigenous women were being harassed by the pigs, so, in the heat of the moment, my friend and I began yelling for the men to take to the front. So, I went there to serve that purpose. To save indigenous women, and ensure they were being protected. Indigenous women are the ones holding prayer circles during these actions, standing on the front lines, yelling out, um. The women are really sustaining this movement. Mallika: It sounds heartening and petrifying at the same time! Navkiran: Yes, exactly. It’s all kind of a blur when you are actually standing at an action. But intellectually you know that there are police from all different states … I went to four different actions. One at the site where they keep the actual equipment to work on the pipeline. And that one escalated the most. Because that was clearly an effort to interrupt work for the day … But really, we got there late, the trucks had already left for work, so it was just a prayer circle, but then the cops responded to our backs. About 700 people and just as many cops. Rubber bullets, tear gas, they were physically pushing. And then once we all got back into our cars … we had to caravan over there … they sped past us, with lights, and then they blocked us from departing. 100-200 cars and police in front and behind. Mallika: And then what happened? Mallika: What about the other actions? Navkiran: And at the next action, there were pro-pipeline protestors. Like 10-12 of them. Yelling hateful stuff, but our focus was on remaining peaceful, prayerful. So water protectors yelled, I Love You! Mallika: And what purpose do these protests serve …? Navkiran: To waste their money, to delay construction. And the more money that has been wasted, the hope is that the investors pull out. Um … with the stopping of construction they have been able to cost them 2 million dollars, per day. That is the purpose. Mallika: So this is not reactionary protest? Mallika: And Standing Rock is not that …? 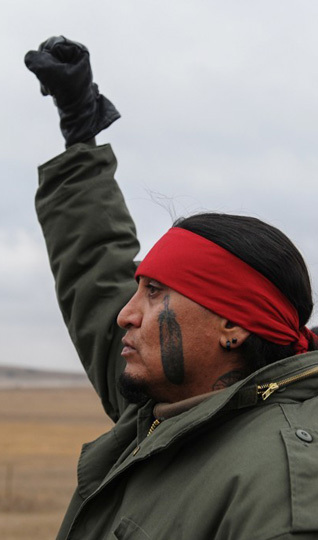 Navkiran: Standing Rock is not that. There is a goal. There is strategy. You know, I am not even told of actions there. No one on camp is told about the action. You trust the action, you follow. They are really smart, they don’t tell people what their strategy is. With reason of course. There are informants etcetera, so you just go … you follow. Mallika: And you had a larger picture of water and land and Punjab in mind. There are so many issues … why this one, why now? Navkiran: If not now … then when, right? [Long pause.] It’s a really good question. Why water, why now. I really do feel connected to water, to earth, as a life. Water brings life. So do women. And thinking back to where my family is from, Punjab, this land is marked by rivers, by water, and the life that water provides … and how its all under extreme and urgent threat. I feel when I think back to when Sikhism first began, from my understanding, my knowledge of what I’ve studied, its this idea of living simply. And communally. And farming and having care. Having care for land. Not producing more than we need. And yet, here we live in this capitalist society that is tearing down forests … so people in the U.S. can have more dairy and meat than they need … and we are just slowly destroying the very earth that gives us life. My connection to Sikhi draws me to this fight. It all came together for me really. We have Black Lives Matter here. And Trump being elected and the promises he’s made. And we have Modi over in India wanting to block off the Punjabi rivers from going into West Punjab, and Pakistan. It’s all a matter of … if we don’t do this now, we won’t have anything for our future. From what I know of Sikhism, from what I have studied, we are here to be of service. To the land too. The land that gave us life. And to other people, other lives. So yea, I just felt like I couldn’t go to my 9-to-5 job any more without offering my direct support for Standing Rock. At the basic level, if we don’t have our earth, what’s the point of everything else? Mallika: Did you know much about indigenous rights before? Did you follow with interest what was happening before Standing Rock? Navkiran: Some. Enough. Look, it’s pretty simple. As a Sikh and Punjabi person, I related immediately to this. We’ve known persecution in our land. And now too, its happening there. Umm ... Indigenous folks barely exist in this country any more. Numbers dwindled down and they have very little representations … We know what it’s like to fear extinctions. Mallika: How do you plan to remain involved? Navkiran: Look, it’s not over. I will still be raising money. Still liaising with people on the ground and spreading the word on what is needed … I have told people to send cash and not necessarily supplies. They can use the cash to get what’s immediately needed. And yes, this news about things being halted is heartening. But also, remember, the project could still be approved ... the re-route could still be awful ... there are a ton of possibilities. There is no time or luxury to sit back and watch. As I work with other people, as I learn their stories, it helps me connect with and make sense of mine. Also it helps me reflect on how I grew up and why I may have felt disconnected, and it makes sense. And I can stop resenting myself, and turning energy into something more productive. I’ve been building bridges with communities for years, and now, more than ever, we need to be united. I really hope to use this experience and knowledge to keep building and be meaningful to solidarity work. 1: Ajit Singh Batra (Pennsville, New Jersey, USA), December 09, 2016, 7:05 AM. Navi seems to have absorbed Sikhi at its roots. She has an innate quality, believing that life of spirit is more valuable than mere physical existence. The weak, in this case her friend, must be protected against oppression, but without aggressive intentions on her part. Truly, Navi demonstrates the virtues of bravery, courage and self reliance. God bless her. 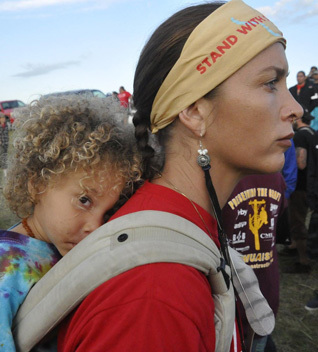 Navkiran Kaur at Standing Rock"